Behold, this is an extremely rare sighting: an Apple Watch launch line, a species once thought to be entirely extinct. In their natural habitat, a sidewalk outside of a posh storefront, these Apple consumers laid in wait for up to 25 hours to prey on the first iPhone-compatible smartwatch from Apple. Ironically, the Apple Watch battery life wouldn't have lasted the entire time if they had been wearing one. We caught up with the one remaining herd in the US outside of Maxfield Los Angeles, a fancy Chanel Fashion store in Hollywood, where they braved the high Apple Watch price. The leader of the pack, Richard Ryan of Tennessee, said he arrived at 8:00 am the previous morning. The store didn't open its doors until 9:00 am today, coinciding with the Apple Watch release date. Ryan said he ended up with the stainless steel Apple Watch, noting that he would have gotten an 18-karat gold Apple Watch Edition for his YouTube channel if it was available. This store had the Sport and normal Watch available. There are only six stores worldwide selling the Apple Watch today, and none of them are an official Apple Store. Other cities include Tokyo, London, Paris, Berlin and Milan. Like Maxfield, all are upscale fashion locations everyday Apple fans don't shop at. Most pre-orders went through the Apple Store online and shipped starting today. 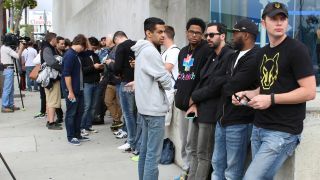 There were about 250 people in line when this Los Angeles store opened, a fraction of count we saw all over the country when the iPhone 6 and iPhone 6 Plus launched last year. Maxfield employees tried to drum up the excitement, but they were no Geniuses at it. None would confirm how many units were in stock, either. Apple has hinted that this subdued launch launch is a temporary policy, which is good news for Apple diehards who want to camp for the iPhone 7.